Hypoxia is the lack of oxygen in the water column. In the Gulf of Mexico’s Texas-Louisiana Shelf, hypoxia is defined as seasonally low oxygen levels (less than 2 milligrams/liter). This Gulf of Mexico “dead zone” is caused by input of excess nutrient pollution, primarily nitrogen, to the gulf from the Mississippi River. Due to an overabundance of nutrients, excessive algal growth (eutrophication) may result and demand large quantities of oxygen which decreases both dissolved oxygen in the water and available aquatic habitat in the water column. The significant decrease in levels of dissolved oxygen in the water column results in the death of fish and shellfish and/or in their migration away from the hypoxic zone. The northern Gulf of Mexico adjacent to the Mississippi River is the site of the largest hypoxic zone in the United States (8.5 million acres) and the second largest hypoxic zone worldwide. 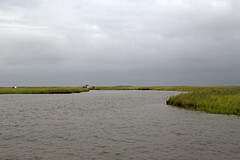 Freshwater and sediment diversions from the Mississippi and Atchafalaya Rivers may help reduce the hypoxic zone off Louisiana’s coast by channeling nutrient-rich waters into coastal wetlands, where the nutrients can be used or trapped by marsh and aquatic vegetation.